Our biggest contest of the year starts today! How would you like to be entered to win prizes from some of your favorite Sunshine Rewards merchants? Plus, earn increased cash back on different merchants each day. Based on your feedback, we brought back the popular raffle contest! You can earn entries every day from now through Christmas when you shop and take surveys at Sunshine Rewards. 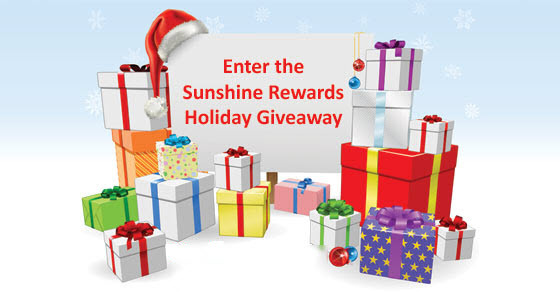 Simply visit the page for the Sunshine Rewards Holiday Giveaway and click to enter. There's more! You can earn a bonus from Sunshine Rewards for your total entries during the contest period. One bonus per member. Earn a bonus of $10, $15, or even $30! And don't forget about the increased cash back. Over 60 merchants will be featured with cash back between now and Cyber Monday. Combine that with the deals they are running and you'll be celebrating the holidays early!